Brushing is important, but flossing is 40% of cleaning your teeth. Brushing and flossing are primary tools for preventing dental disease (see Gum Disease/Periodontal Disease) and maintaining optimal dental health. Proper technique is necessary to protect teeth, gums and bone from disease. Cleaning your teeth should be thought of much like cleaning your body in the shower or in a bath; or simply put, cleaning your mouth. She’s going to place the toothbrush at a 45 degree angle to the teeth. Ineffective brushing, regardless of frequency, does not prevent dental disease. Unless you effectively remove bacteria, or Dental Plaque (also known as biofilm) every time you consume sugar, acid produced by plaque will dissolve teeth, resulting in tooth decay. In addition the dental plaque of gum disease will cause your own body to attack the gums and bone around your teeth resulting in the onset of gum disease (periodontal disease). 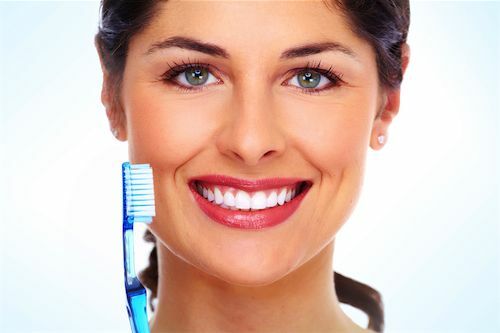 The toothbrush should not be dragged back and forth over the tooth surfaces; the focus is to concentrate the brush bristles in specific areas long enough to lift and remove dental plaque (a gooey, sticky film of various layers of bacteria). You need to take your time: three to five minutes is ideal. Use a mirror and watch what you are doing until you become proficient. When brushing the upper back teeth on the cheek side, shift your jaw towards the side you are brushing, to make room for the toothbrush to reach half way around the back of the last tooth. The other half can be reached when you brush the tongue side. Develop a system that reaches all areas of the teeth (e.g., start at the upper right and work your way around the upper arch to the left, then move to the inside until you finish on the upper inside). Repeat the process on the lower teeth. Hold the brush at a 45-degree angle, bristles under the gum, with your brush handle parallel to the teeth you are cleaning, so the tip of the handle is on the opposite side of your nose. To effectively brush your front teeth on the inside, place the brush upright and parallel to the teeth, push either the head or heel of the brush against the teeth and under the gums, and jiggle it in tiny movements. Overlap each area you are cleaning with the previous area to avoid missing any teeth. Use a “jiggling” motion as circles tend to get too big, and rolling upward or downward does not clean under the gum line. Note: right handed people miss the upper right canine (eye tooth); left handed people miss the upper left canines (eye teeth). When you start brushing on the right molar side (for right handed individuals) and begin to move toward the front of your mouth, turn your head right in order not to miss the right canine. The same holds true for those who are left handed. Three points need to be understood about using a mechanical toothbrush versus a manual toothbrush. The mechanical vibration of this type of brush does all of the “jiggling” for you. The toothbrush is NOT dragged back and forth. It will clean your teeth better than a manual brush. The instructions above for overlapping and placement of the brush still need to be followed, as the toothbrush is only as effective as the technique used. The proper technique for flossing. Flossing is perhaps the most misunderstood dental issue. If you are not flossing, bacteria are growing and living between your teeth and under your gums, causing odor, cavities (tooth decay), gum disease (periodontal disease), staining, and bleeding. Why? Though some cleansing foods – such as apples, salads, and meat – have the capability to remove and interrupt the activity of dental plaque; these foods do not get to the bacteria between your teeth and below the gum line. Flossing should be thought of as brushing between teeth as your toothbrush will not reach between them. This patient is using a floss aid to clean between his teeth. 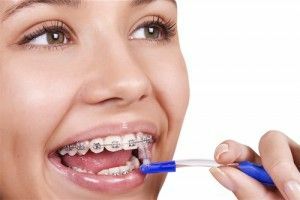 If you find flossing difficult, many different types of floss and flossing aids are available to assist in thoroughly cleaning between your teeth. 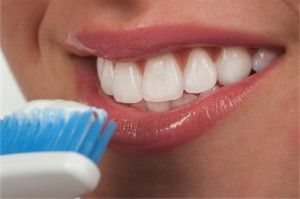 Brushing thoroughly, removes all the plaque your brush can reach, but skip flossing, and you miss 40% of tooth surfaces. Wrap the floss around your middle fingers; not your pointer fingers. You need your pointer fingers to control and manipulate the floss. Seesaw the floss only to get it between your teeth. Wrap the floss around one of the two teeth you are between in a C shape and rub the side of the tooth two or three times, gently bumping into the gum tissue. Then wrap the adjacent tooth and do the same thing. Do not “seesaw” on the gum tissue. Remember to floss behind the last tooth in your mouth, as there is a good chance your brush did not reach there. 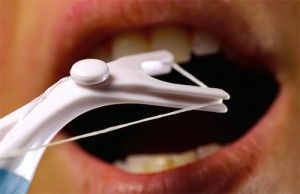 Flossing is nothing more than cleaning between your teeth where the brush cannot reach. You are washing the sides of the teeth, much like you wash your arm or leg in the shower. Cleaning your tongue: If you could see the surface of your tongue under a microscope, you would see a ‘forest-like’ structure where bacteria can live and cause bad breath. Bacterial laque (Dental Plaque) can also grow on the surface of your tongue. Your tongue is covered with tiny projections that can harbor bacterial growth and cause bad breath. Use either a toothbrush or a tongue scraper to remove or reduce bacteria. To be thorough, you should get as far back on the tongue as you can, which can induce some degree of gagging. Most patients develop tolerance to tongue brushing or scraping; though some cannot tolerate even the slightest touch of an object to the back of their tongue. Used properly, the waterpik will effectively kill and remove dental plaque under the gum line and between your teeth. As with any tool used to clean your teeth, without proper technique, bacteria will remain and thrive. There are many mouthwashes on the market designed to kill bacteria under the gum line and between teeth that can be used with the waterpik. One of the downsides of these products is the cost. Simply using 1 part bleach to 40-45 parts water in your waterpik will kill bacteria between your teeth. The spray of the waterpik should be pointed between the teeth on both the cheek side and the tongue side because the spray needs to travel between each tooth individually. The bleach solution is not stable, so it has to be mixed each time you use it. Although it is cheaper to use bleach, it is caustic and may eventually harm the waterpik, so a capful of antibacterial mouthwash mixed in the water reservoir may be preferable. There are many over the counter aids developed to help patients thoroughly clean their teeth and mouth. Many of these items are called “stimulators”, which a misnomer; we’re not trying to stimulate the gum tissue, it will be healthy simply by removing bacteria. Therefore, even though the tool may be called a “stimulator” ask yourself: will it remove the bacteria stuck to my teeth? Demonstrating one of the uses of the proxibrush.